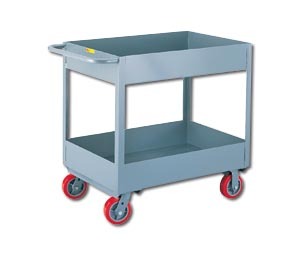 Extra deep tray cart to contain parts, packages or inventory. Smooth rolling on 5" x 1 1/4" or 6" x 2" polyurethane casters -- two swivel and two rigid. 3600 lb. capacity models feature extra reinforcement. FOB Shipping Point. W x L Wheel Size Tray Depth Wt. (lbs.) Price Ea. * Top shelf only 12" deep / Bottom shelf 1-1/2" deep.